I think all of my posts should start with So. I just can't seem to begin them any other way! So our needs: a washer & dryer and a new vehicle. The washer & dryer because, well, our clothes aren't clean. I know that's gross, but it's the honest truth, and I'm sick of it. The vehicle because as much as I like being with my hubby, sometimes I'm not with him and that involves two vehicles. You can explore my poll on the right to find out just where I'm heading on the vehicle front, but for the washer & dryer . . . please hear this tale. Tony and I ran over to Warners Stellian on our lunch break today and succeeded in being insulted. I didn't like the salesman initially, but when he basically avoided answering our question concerning comparing two pairs of washer & dryers, I was annoyed. This annoyance prepared me well for the insulting. Tony asked the salesman, again between the two pairs, which was more user friendly. Now up until this time, the salesman was only speaking to Tony, but in answering this question, he honestly turned his body, so that he could address me. Specifically. Like giving Tony the cold shoulder. I was pissed! Um, excuse me, but do not put your stereotypes on me! To solidfy the fact that we were not going to give him any business, when we asked a question about the financing options . . . he grabbed a credit application and with a knowing tone, handed it to me and said, "And I'm going to assume that you'll be filling this out." Again, wrong buddy. He did not get a strike 3. So we're thinking about this guy the LG WM2016CW, apparently consumer reports ranks it pretty high. We know one thing though, that guys not getting the sale. Leah, if you would like some advice on washers and dryers let me know. My dad works for whirlpool and I can ask him as many questions as you would like!! GL! Hi-I came across your blog from Kristal's blog. I just wanted to say that I feel your washer/dryer pain. I had the worst experience ever at Sears, and basically went without a w/d for a month because of them. We had a great experience at Lemcke in Webster. I literally offered them my first-born when they installed our shiny new w/d in our tiny closet. We got a front loader and couldn't be happier! What the eff - I feel your pain, I hate people like that. 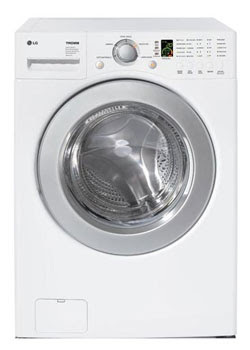 I have the exact LG washer and dryer that you posted about and I love it!!! It's easy to use and it gets the job done!! We got ours at Sears. They were having an appliance sale you should check the website. I have no 2 cents on the washer & dryer (altho the pictorial is quite lovely!) however I LOVE starting posts with "So". I feel like it's the only way to start them sometimes. "so" is a great way to start posts, duh! Washer and Dryer talk makes me realize that we are grown ups now. But that one does look pretty fabulous.